A famous quote from Dr. Seuss reads, "The more that you read, the more things you will know. The more things you learn, the more places you'll go." (I Can Read With My Eyes Shut!). My family interprets the quote quite literally. 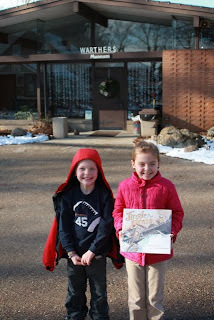 Often, reading books together has inspired us to go places we would not have normally visited, to enhance the newly acquired knowledge we gained from the picture books. This week's birthday celebration for Patricia Newman is another example of how a picture book got our family yelling, "All aboard! It's time to shove off on another adventure!" Patricia Newman is the author of many books for children including Nugget on the Flight Deck, illustrated by Aaron Zenz and Jingle the Brass, illustrated by Michael Chesworth. Before publishing her first book Jingle the Brass, Newman was a teacher, a computer programmer, and wrote for magazines and various other publications. She described how her first book came to be on Aaron Zenz's Bookie Woogie blog, "I was walking around a railroad museum one day, and I got an idea for a book -- but for much older kids, like a novel. So I started to do some research. I went back to the library that the railroad museum has, and I talked to a retired railroad engineer - a man who actually drove locomotives. He took me on a tour of the railroad yard and he started using all these cool words like "bending the iron" and "putting on the nosebag" and "eggs with headlights" and "on the plush" And I thought those words sounded really fun. So I put aside my long chapter book for older kids, and I decided to write Jingle the Brass." 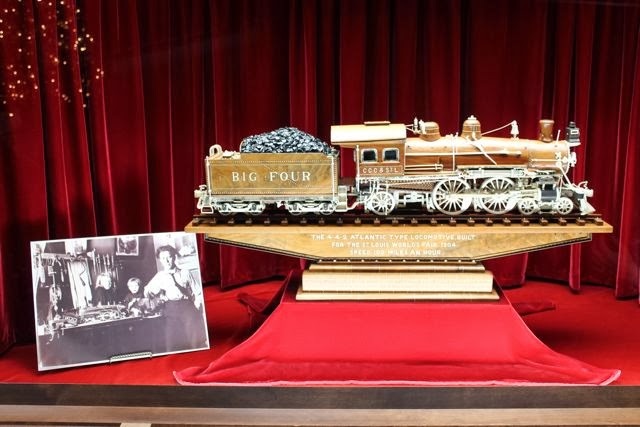 The Smithsonian National Museum of American History recognized the importance of Patricia Newman's Jingle the Brass with its inclusion in the online resource, Our Story: American History Stories and Activities You Can Do Together. A special activity guide was designed to bring the book to life and is available on the website. This recognition was certainly warranted because of the Newman's effort to make sure the book was historically accurate. "When you write a book like this the mood, the setting, everything counts. It all has to be real. The last thing you want is for somebody to say that it is not accurate. The book (Jingle the Brass) went through a lengthy copy editing procedure. Every single fact was checked." (Capital Radio "Insight" Interview). My mom's cakes! When I was little she always made the most amazing cakes. I remember a little girl with white frosting decorated with different colored coconut (I loved coconut -- still do!). Brown for the hair. Pink for the dress. Blue shoes. You get the idea. And they tasted delicious, too! 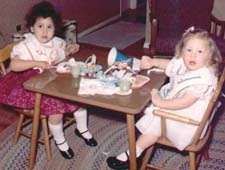 Here is a photo of my friend and I -- we must have been 3 or 4. (I'm the one with the dark curls.) This is one of my birthday parties, and we've just devoured our pieces of cake. Almost a year ago, when I learned of Patricia's birthday, I remember looking up her books to see what ideas might come to mind. 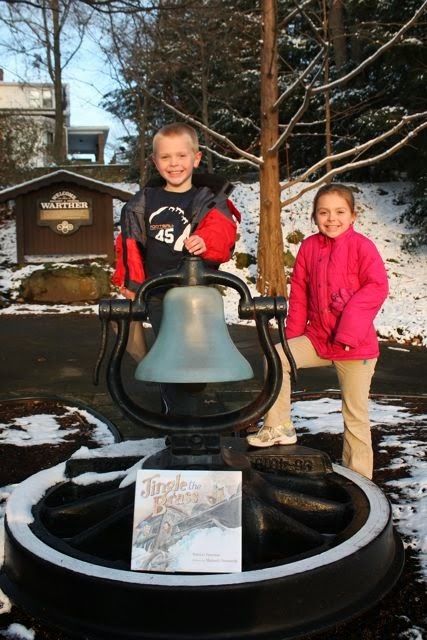 I thought right away that I would take my kids on a train ride to bring Jingle the Brass to life. Upon reading the book this week, first to my youngest daughter, I learned that the train I planned on riding in the Cuyahoga Valley National Park wasn't going to work. 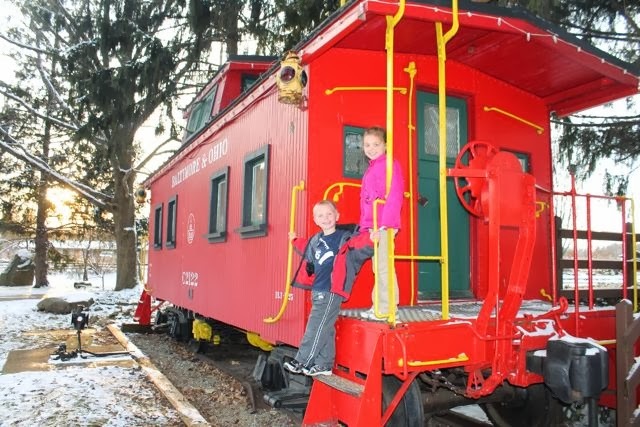 The locomotives currently running on the Scenic Railroad are diesel-electric and Jingle the Brass is a picture book that transports the reader back to 1926 during the heyday of steam-powered trains. 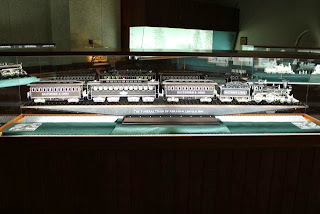 I spent the night researching local railroad museums and other possible locations for a road trip, but nothing was exactly what I was looking for. I asked my wife if she knew of any other places we could go. 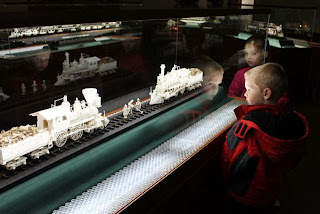 She recalled a museum that her grandfather took her to when she was a child. We found that the museum was still open and after reading through the information online I had finally found what I was looking for! My two older children and I headed south to Dover, Ohio to visit the Warthers Museum. Unfortunately, the rest of the family was unable to travel with us because of a stomach bug we have been passing around our family. Inside the museum we found a collection of 64 model trains spanning the history of the steam-powered engine. 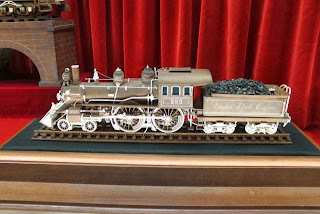 All the models were precisely carved by Ernest "Mooney" Warther. The collection featured carvings that were made from walnut wood, bone, ebony, ivory, and pearl. These amazing model trains were carved to exact scale with moving parts. As we peered through the glass we could almost hear the "hogger" jingling the brass. 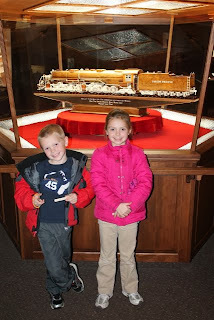 My children really like the model of the Union Pacific "Big Boy" which took Warther over 10 months to carve. 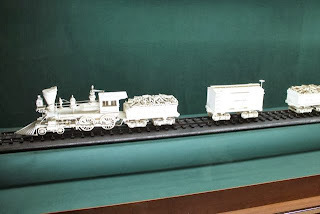 Watch this video all about this train carving - YouTube. In Jingle the Brass, we learned about the reefers and hoppers that carried the cargo on the train. Our tour guide said THE LINCOLN FUNERAL TRAIN OF ABRAHAM LINCOLN 1865 is often referred to be guests as their favorite model. Ernest Warther carved this at the age of 80! When our tour concluded I read Jingle the Brass to my children in the middle of one of the exhibit rooms. We were surrounded by all the trains. The book and the models together brought to life an amazing time in U.S. history for my children. Outside we found an engine that my children were able to pretend they were "riding the point." 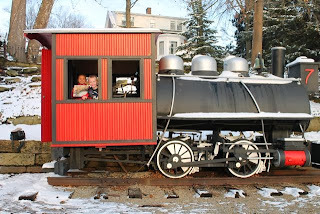 A couple of "honest-to-goodness cowboys" hanging out on the caboose. The perfect end to the day was jingling the brass! This was an amazing experience. My children loved it. If you are ever in Ohio, I urge you to bring along a copy of Jingle the Brass by Patricia Newman and visit the Warthers Museum. Patricia, thank you so much for contacting me to share your birthday! Your books are great resources for children and provided the inspiration for a memorable reading experience for our family. I really appreciate that the time you took to share your birthday memory too. We hope have a wonderful birthday and that you get to enjoy a big slice of coconut cake!